This entry was posted in Auto Insurance, Car Safety Tips and tagged auto insurance on 12/16/2015 by admin. If you’re like most people, when traveling half way across the country by car to visit your friends, you may not have a roadside emergency kit. It’s not unusual for you to focus most of your attention on things like suitcases and car-friendly snacks. And, stocking a roadside survival kit may be the last thing on your mind – unless you get stuck somewhere without an important item that could make a difference in the outcome. Anytime something unexpected happens, we count on our cellphones to get us out of trouble. But, what if you break down on a dark, desolate stretch of road with no cell signal and you have a blowout or a dead battery, which means no emergency flashers and no way to reach AAA? What then? Things could get awfully spooky in a hurry. Being stuck in the boonies in the middle of the night without a flashlight or flares could easily be your undoing, especially if your vehicle is partially blocking the road. That’s why so many safety agencies, including the California Office of Traffic Safety (OTS) recommend carrying a well-stock roadside emergency kit in your car at all times, although the majority of us don’t even carry any of the basic items that could add safety to your commute as well as get you back on the road quickly. Okay, so that sounds a little excessive for someone driving a Prius, but there is a happy medium. 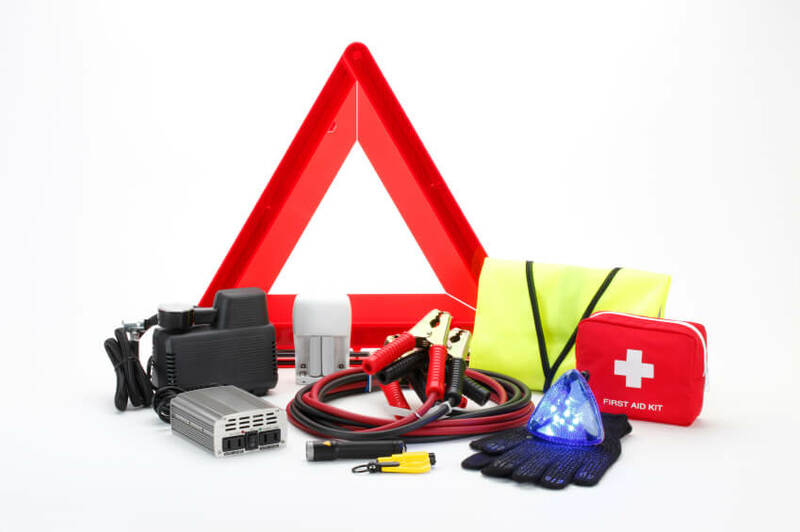 In fact, aside from the granola bars and bottled water, you can simplify things by purchasing a pre-assembled emergency roadside kit from a number of reputable, brand-name companies, including online. These kits tend to be small enough to carry in the trunk or back seat of your car. That way, you won’t have to pull a U-Haul to carry everything on the list. Once you’ve purchased your pre-assembled kit, don’t wait until you have a roadside emergency to open it and peek inside. Familiarize yourself with its contents ahead of a crisis so you know how to use each item. And, above all, use common sense. You may also want to use common sense when shopping for car insurance. Don’t take what you’re currently paying as the best auto insurance rates available. Make sure you’re not overpaying for coverage by getting a free auto insurance quote comparison today! Do you carry an emergency roadside kit in your vehicle and has it every come in handy? Feel free to share your thoughts in the comments section below.